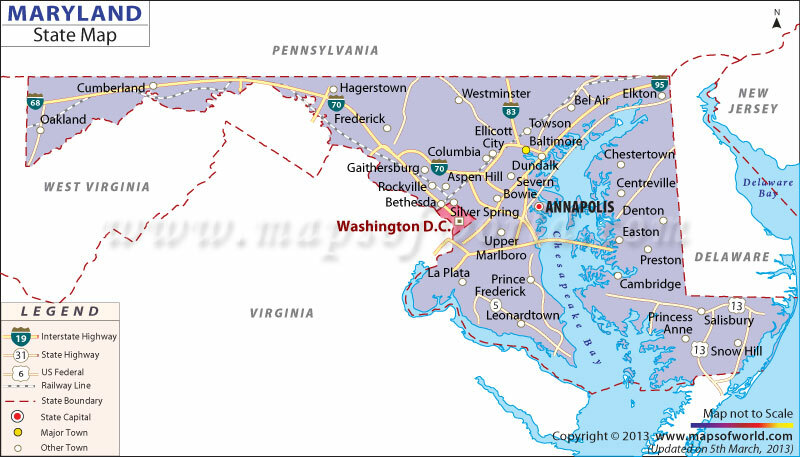 Maryland is on the eastern seaboard of the United States. West Virginia, Pennsylvania, Delaware, District of Columbia and the Atlantic Ocean surround it and are also shown. Maryland is comprised of 24 counties, each governed by an individual county seat. The counties and their seats are shown. Railway routes, roadways, capital, state and national highways and other important cities are labeled on the map. The routes of 30 427 miles of public roads and 1,232 miles of railroads are also shown.